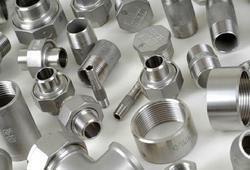 We provide a huge assortment of Forged Fittings for our esteemed clients. They are made from quality-approved materials to ensure the satisfaction of our valued clients. We offer these products in various designs, shapes and sizes, keeping in view the requirements of our clients. Furthermore, they are light weight, high breaking point, extremely durable and accomplished in international standards sizes as well as in customized range with on time deliveries. 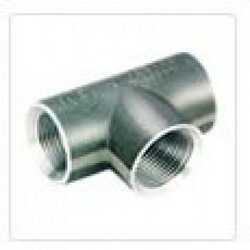 We offers multiple range of stainless steel ASTM A182 Forged Fittings. These products have got recognition at different customer markets. Stainless steel ASTM A182 Forged Fitting are known for corrosion and abrasion resistance. We specialize in manufacturing Pipes, Fittings, Flanges, Fasteners, Round Bars in the following material quality, We request you to send all your enquires for the above mentioned products and give us a chance to provide your honored company our quality service. 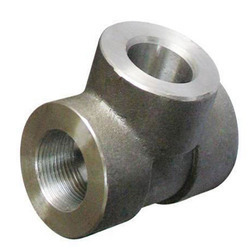 Offer a comprehensive range of Forged Tee that are widely used in petroleum refineries, electric power plants, food processing plants, nuclear plants, pharmaceutical and other various industries. Widely known for their features like corrosion resistant and high tensile strength, our range of tees are known for durability and efficiency. Carbon Steel Forged Tee: ASTM A234 WPB, WPBW, WPHY 42, 46, 52, 60, 65, 70. Nickel Alloy Forged Tee: Copper Nickel, Hastelloy, Nickel, Monel, Inconel, Alloy20 Etc. 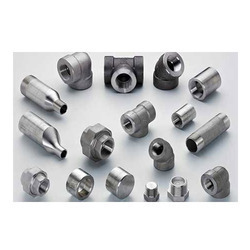 Katariya steel distributors Offer a comprehensive range of Forged Tee that are widely used in petroleum refineries, electric power plants, food processing plants, nuclear plants, pharmaceutical and other various industries. Widely known for their features like corrosion resistant and high tensile strength, our range of tees are known for durability and efficiency. Owing to the huge infrastructure, we have been able to bring forth the clients an exclusive collection of Carbon Steel Fittings to our esteemed customers in supreme quality. This slippers is a protective fittings and is widely designed in a plethora of designs and patterns. Excellent quality material has been used in the making of this range. We avail this range in standard size of foot length which is perceived to the ideal length. With the aid of our skilled workforce and experts, we are able to bring forth a rich collection of Copper-Nickel Forged Fittings in quality-approved materials. Our products are made up of extremely durable items and have stylish as well as trendy appearance. Patrons can avail them from us in varied sizes, designs and versatile colors as per their requirements. Further, we offer them to the clients at market-leading prices. 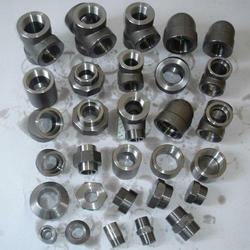 With the aid of our procuring agents, we have been able to bring optimum range of Alloy 20 Forged Fittings. These assured quality products are fabricated by the proper utilization of sourced high quality raw material, which is purchased from the most trusted vendor of the market. 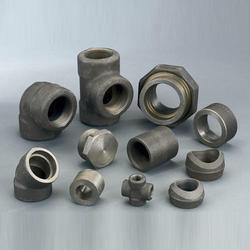 We offer Inconel 625 Forged Fittings in assortment of outlines to meet the particular application prerequisites. hese titanium Forged fittings are made to give release free associations with substance, handling plants, oil, gas, petrochemical and force era commercial enterprises. They are generally refreshing for its quality, consumption safe, and fine wrapping up. These items are accessible in distinctive details relying on its size, sort and grade. Enriched by a team of creative and experienced professionals, we are engaged in offering a broad range of Stainless Steel Forged Fitting. These products are fabricated in tandem with highest quality standards, exquisite prints and textures, keeping in view our clients requirements and preferences. Moreover, our professionals make use of latest technology and advanced tools and equipment in order to deliver flawless range of products to our clients invery affordable prices. 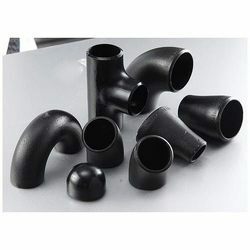 We specialize in manufacturing Pipes, Fittings, Flanges, Fasteners, Round Bars in the following material quality, We request you to send all your inquires for the above mentioned products and give us a chance to provide your honored company our quality service. We offer a diversified range of the Forged Fittings which is manufactured using the finest quality metals and alloys to ensure the flaw less performance and zero defect in fabrication. Grades: 202, 304, 304L, 304H, 316, 316L, 316Ti, 321, 321H, 317, 317L, 310, 310S, 409, 410, 420, 430 etc. 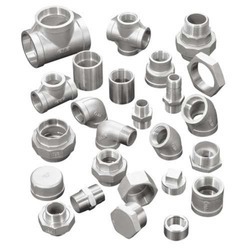 We are among the leading organizations engaged in manufacturing and supplying an excellent quality assortment of Alloy Steel Forged Fittings. Our professionals procure fine quality threads, fabrics and other raw material, from authentic vendors of the market and make these suits available at leading prices in the market. These apparels are widely appreciated by the customers for their exquisite designs, elegant patterns and vivid colors which we provide after quality checking to our esteemed customers. 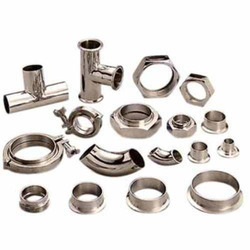 We are among the top organizations engaged in offering a commendable range of Carbon Steel Forged Fitting opulently designed by our professionals who make use of excellent quality fabrics, threads and other embellishments, these products are made available to the clients at leading prices in the market. Moreover, we make sure to offer the entire range in varied specifications so as to meet the exact requirements of the customers and serve them in the best possible manner. 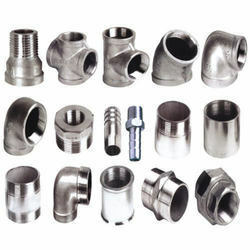 We hold immense expertise in manufacturing, supplying and exporting a broad range of Stainless Steel Forged Fittings. Our products are manufactured making use of premier-grade raw material sourced from the leading vendors. Owing to their corrosion, heat & pressure resistance and high tensile strength, longer service life as well as superior finish, offered products are highly demanded in the market.